"Fried rice in 15 minutes! 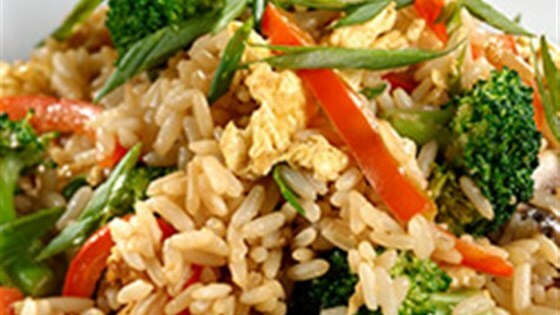 Cook Minute® Rice with chicken broth, stir-fry vegetables, soy sauce and egg. You'll feel good about serving your family this low- calorie, low-fat dish." Heat oil in large skillet on medium heat. Add eggs; cook until set, stirring occasionally. Remove from skillet. Add broth, vegetables and soy sauce to skillet; bring to boil. Stir in rice; cover. Remove from heat. Let stand 5 minutes. Stir in cooked eggs. Serve immediately. Flavor In A Flash: Add sesame oil, five-spice powder or Sriracha sauce for an extra kick! Not impressed in the least. It was nothing like stir fry rice. I made the recipe exactly as written but left out the vegetables. It was delicious! Will certainly be cooking it again!!! I have tried so many "fried rice' recipes and this is the only one I'll be using from now on. Perfect as is, and of course you can add any accompaniments you prefer.